Oh, Dear Readers, this is my favorite television program. This is a tragedy. Why is this a tragedy you ask? There are only six episodes. What? Surely you mean six seasons, right? No, I do, indeed, mean six episodes. Each season is three episodes and each episode is two hours long (with commercials). The real tragedy is the length of the hiatus between seasons…I don’t even want to think about it, but for you I will. The first season aired in 2010. The third season will air the end of 2013 or the beginning of 2014…does that give you a clue? So with all of these egregious insults to the fans, why is it that this is still my favorite show on television? It is just that stinking good. This is a show about Sherlock Holmes (you’re shocked, I’m sure), and I have been a fan of Sir Arthur Conan Doyle’s detective since…well, I can’t remember when I read the first stories. I do remember that I borrowed the book from my cousin in my early teenage years, and I never returned it. I still have it on my bookshelf today. (Really truly sorry.) It has been read well. It isn’t a book that is there for decoration only (Apparently this is a thing people do, buy books to look at them and not to read…why? It’s a book! Read it!). I don’t have books that are for decoration only. I almost didn’t watch this when Netflix recommended it. The BBC had created a modernized Sherlock Holmes. I was a little worried about a modern Sherlock. Holmes just seemed so at home in 1895, that it was hard to imagine him in our modern era. I didn’t want them to do something silly like…move him to New York. (Sorry,Elementary, I bear you no ill will. I swear! I am a big Johnny Lee Miller fan, but, for me, Holmes just belongs in London.) Two things persuaded me to give it a shot. First, co-creators Steven Moffat and Mark Gatiss write for Doctor Who. (Yes, I am a Whovian. It will get its own post, but it is very hard to explain and still sound…sane.) By this point, I’d become addicted to Doctor Who and I finally understood the cries of “MOFFAATTT!! !” that explode across the internet when certain episodes are mentioned. Anyway, who doesn’t like to suffer more emotional trauma at the hands of a writer who has already proven that the scariest villains are the ones who “kill you kindly”? I did not understand what a danger Mark Gatiss would become…I have since learned my lesson. Always beware (but watch immediately), when these two are in cahoots! Steven Thompson came out of left field and clobbered me, I had no idea. Apparently, I am a glutton for punishment. 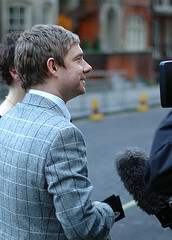 Secondly, Bilbo Baggins plays John Watson…I mean Martin Freeman, who plays Bilbo Baggins, plays John Watson. (Yes, I am also a Tolkien fan. I could go on and on about The Hobbit, The Lord of the Rings, The Silmarillion…Good grief, just to attend one of his lectures…) Martin Freeman did such an excellent job of embodying a favorite character who I have visited regularly from somewhere around the age of 12 through….well, 36 in The Hobbit, that I would have been willing to watch him act out the phone book. I began the first episode A Study in Pink on a Saturday morning. I watched the last episode The Reichenbach Fall later that night. Here’s what I discovered. The writers are brilliant. The actors take these brilliant writers and bring the characters to life. The jerks make you love the characters and then…yep, trauma. (I mean all of you, actors, writers, photography people and don’t forget the music…you’re all to blame!) The rest of the crew make everything look so striking and lovely and…well, long before the end credits rolled on A Study in Pink I was hooked. There are all these details you need to pay attention to. You can’t be doing other things while you watch, because this is a show for thinkers. Sunday, I called a friend and I ensnared her too. There was no way I was going to suffer alone. (You’re welcome, you know who you are.) Right, I think you’ve caught on to the fact that I watched the entirety of the show twice in two days now. Still not bored. However, A script will only get you so far. In order to bring a show to the kind of popularity that Sherlock enjoys, you need so much more. The facial expressions…good grief. Martin Freeman’s John Watson is unbelievably good. The delivery of the dialogue is perfect, but John Watson’s silences speak louder than his words in many scenes, and it is fitting for a taciturn former Army doctor. John defies everyone’s advice when he befriends Sherlock, and you can almost see the “screw you, I do what I want” written on his face during these scenes. 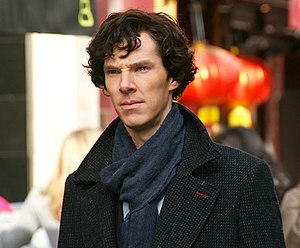 Sherlock Holmes is played by Benedict Cumberbatch. He really brought Sherlock to life for me. I read the books without thinking too much about what makes him who we see when he meets Dr. Watson. I’m reading them again with a different eye now. Mr. Cumberbatch makes Sherlock, a self-proclaimed “high functioning sociopath”, human. Given, he’s a human who is awkward, lacking in any kind of social niceties (unless he’s faking it to get information), and who really has no idea how to relate to people, but he is very human, nonetheless. In the original Doyle, Holmes was always at the cutting edge of technology and science. Our Sherlock is no different, his designer clothes, constant texting and use of Google at crime scenes is something that is something that is easily imaginable for Doyle’s Holmes. You catch guarded glimpses into a man who has been damaged. For a man as seemingly cold as Sherlock is to tug at the heartstrings takes an amazing actor, and Benedict Cumberbatch certainly delivers. Seriously, I could rave about the brilliance of the acting in this show for pages, and I’m not even touching on performances by Rupert Graves, Louise Brealey, Una Tubbs, Lara Pulver, Andrew Scott, and Mark Gatiss himself right now. The cinematography is just fantastic, and the music! If I tried to say everything I want to about this show in a single post, I’d still be writing by the time Season Three airs, which feels like half past never, although they promise the end of this year or the beginning of next….I got sidetracked. Sorry. I’m getting impatient. Okay, fine, maybe it is just that both the main characters are played by amazing actors who have catapulted into hugely successful careers on the big screen…Star Trek: Into Darkness, The Hobbit are just two of the multitude of projects these two have taken on. Here are a few others, and I know I haven’t even gotten half of what Mr. Cumberbatch has been working on. The World’s End ,The Fifth Estate, and August: Osage County don’t even scratch the surface. It isn’t like they’re busy or anything. Maybe they all just like to torture the fans. I’ll tell you this much, I’m sure none of them will ever tell you which it is. About the fans though…The “fandom” it is one of the oldest and most eccentric out there. The Sherlockians are enthusiastic, incredibly knowledgeable, and just don’t go away. They even warrant their own entry in Urban Dictionary. Fans of the show, obsessively pick over every detail of each episode (there’s nothing else for them to do while they wait for the next to air). They create elaborate theories, and can find clues and hidden meanings behind all sorts of things. Then they begin to get bored…you really shouldn’t let these fans get bored. They create things…fanfics, memes, videos…then they start to get ridiculous. Is anyone already there with me? This entry was posted on Wednesday, August 28th, 2013 at 3:39 pm	and tagged with Arthur Conan Doyle, Benedict Cumberbatch, Mark Gatiss, Martin Freeman, Reichenbach Fall, Sherlock, Steven Moffat, Television, Watson You can follow any responses to this entry through the RSS 2.0 feed. « They Built a Robot! I absolutely LOVE this show!! Obsessed would be a more apt description. I too am converting as many people as possible. It seems half of my blogs have somehow been related to Sherlock! I am counting the days until season 3 starts. I heard today season 4 has been confirmed!!!! Aaaaahhhhhh! Season 4 confirmed?!?! Awesome sauce! I knew Benedict Cumberbatch had said they were going to do it…I also knew he wasn’t supposed to say anything. I was afraid to hope. You have officially made my day…maybe even my week! Confession, I may be more than a little obsessed myself. This was the first of many posts about my favorite consulting detective. I can’t wait to read yours! I love this show too! I hope they make third season, but that seems unlikely, now that Freeman is starring the Hobbit trilogy and Cumberbatch made Hollywood debut as Khan. Have you seen Midsomer Murders? No worries, my friend! The final episode of season three is filming now. We will eventually get to see how it all went down! Benedict and Martin have both said they would love to keep playing these roles as long as the BBC will air the show. Let me just say, thank you, boys. We will keep watching. I think I’ve heard of it, but I haven’t see it yet…what’s it about?